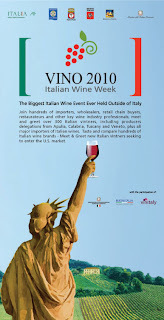 Meet us at VINO 2010 – Italian Wine Week in New York. On Friday February 5th from 12 noon to 7 pm you can taste our wines at the Grand Tasting organized by the Italian Trade Commission. Location: Hilton New York, 1335 Avenue of the Americas, New York City. and as a pre-release the 2006 Dròmos which has been defined “a delicious example of Maremma in this important vintage” by The Wine Advocate of Robert Parker.